In my last newsletter article I outlined a number of governance concerns and I’m happy to report there may be some positive changes on the horizon. The Faculty Association has been active in raising our concerns with our new MLAs and provincial Ministers. Unlike in previous years, this new government has expressed its interest in our perspective, in that it is actively seeking our input into relevant issues. As you may know, the Supreme Court recently ruled on the constitutional right to strike. In order to conform to this ruling, the provincial government consulted widely with groups who have been prevented or hampered from exercising that right. As a result, Bill 4, which recognizes that right for public sector employees, was introduced. The Ministers of Labour and Advanced Education recognized, however, that the situation for academic staff is much more complex and requires a review of the Post-Secondary Learning Act (PSLA) – the Act which determines the governance structure within the Post-Secondary sector. Unlike the typical employee relationship to the employer, academic staff occupy a different space within their institutions in their role as decision-makers regarding academic matters. The government has recognized that this complexity requires thoughtful consideration before changes are made, as hasty decisions could result in unintended negative consequences. To this end, the government is proposing a thorough review of the PSLA, including extensive consultation with Faculty Associations, Student Unions, Graduate Student Associations and Senior Administrators – all of the groups recognized, defined, and governed by the PSLA. Our hope is that a number of indeterminacies within the Act, which have tended to be interpreted with a corporate spin that inappropriately defaults to “management rights,” will be clarified in a way that recognizes and supports the unique function of collegial governance at the core of universities. This will hopefully also extend to structures and processes that require the transparency befitting a public institution that is not only funded publicly but also exists for the public good. In addition to the PSLA review, the government is also reviewing the appointment process for all agencies, boards, and commissions and the skills required of members of such bodies – including the Boards of Governors of universities. We have expressed our concerns about the Board: primarily a lack of diversity in the backgrounds and skill sets of the current board members, who are predominantly corporate. This is not a criticism of individual Board members, who bring needed skills and knowledge to their roles, however the University is a public institution, not a profit-generating corporation. The Board therefore requires some voices from other perspectives, primarily from people who understand the nature of a teaching and research institution and also who bring a viewpoint from other segments of the community. As I write this, we have learned that Minister Schmidt has not accepted the request by the current Board Chair to reappoint three members, whose terms will expire soon. He explicitly notes in his letter that these members are encouraged to apply through the open recruitment process, rather than the internal process conducted by the Chair. The Minister has also been quoted in the media saying there are concerns about the lack of diversity on many boards – diversity of gender, age and ethnicity in particular. Minister Schmidt has also assured us that competencies and potential diverse contributions that could be made by applicants will be taken into consideration in vetting new members. We are hopeful this new process and attitude will bring some much needed change. On another issue, we have also provided the government with a number of concerns regarding the Compensation Disclosure Regulation (the so-called ‘Sunshine List’). While there is no question that the government will include academic staff in their disclosure, we have pointed out to the Minister of Justice and Solicitor General, who is responsible for this regulation, the additional negative impact the disclosure of individual salaries has on the privacy of academic staff. For example, it would be possible by comparing salaries from year to year to determine what merit increase an individual receives (or doesn’t), clearly an issue of a loss of individual privacy. We suggested instead, a listing of cohorts of a number of academic staff receiving salaries within a particular range. The government is still working through the details of this regulation and we hope the Minister will be responsive to our concerns. The text of the letter I sent as part of the consultations on this topic can be found here. Since the election of the new government we have been advocating for the interests of academic staff and the health of the university as a public institution. It has been a refreshing change that our input and perspectives have been invited and recognized as an important component for consideration in their deliberations. The Alberta government has declared a provincial state of emergency in response to the wildfires in Fort McMurray and surrounding areas. In response to this, the Faculty Association has donated $5,000 to the Canadian Red Cross’s Alberta Fires Appeal to provide relief to those affected by this crisis. The Association also encourages academic staff members to make their own individual donations. As per the Collective Agreement, there is an opportunity for ongoing academic staff in most undergraduate and graduate programs to offer one-on-one independent study courses, such as reading or research or thesis supervision courses. In a number of cases, no credit is given for such courses as part of the workload of the academic staff member, yet they are clearly part of the academic program offered by the Faculty. The Collective Agreement contains a letter of understanding (LOU) for these independent study courses. As per the Collective Agreement an independent study course can be deemed optional or mandatory. Whether the course is considered optional or mandatory will affect whether it is calculated as part of an academic staff member’s teaching load. A link to the full text of the “Letter of Understanding: Independent Study Courses” can be found below. Included in the LOU is more information on determining optional versus mandatory courses and how these courses are reported and counted. A copy of the Collective Agreement can be found by clicking here. 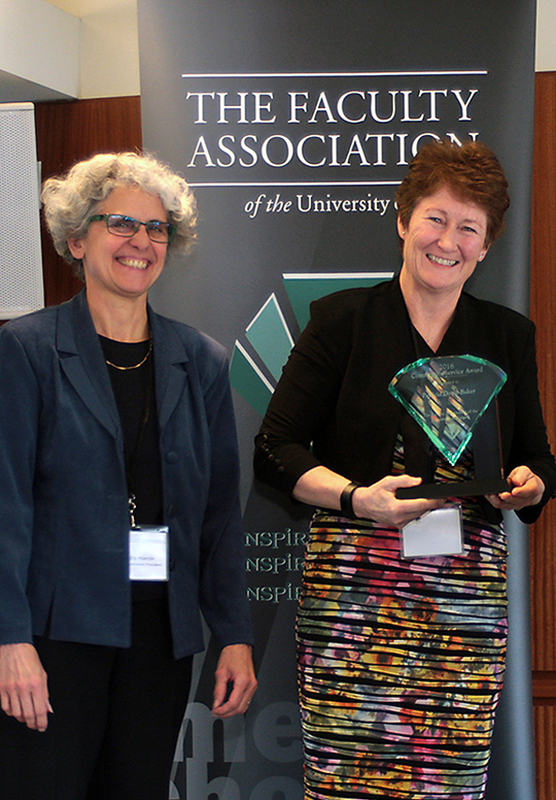 The Faculty Association would like to congratulate Dr. Patricia (Tish) Doyle-Baker from the Faculty of Kinesiology as the recipient of the Community Service Award for 2016. More information on Dr. Doyle-Baker’s inspiring work supporting and strengthening non-profit organizations and causes important in the community can be found here. Pictured L-R: Sandra Hoenle, Association President and Tish Doyle-Baker, Community Service Award recipient. Canada’s census is being conducted in May 2016. This year also sees the return of the long-form census which was announced in fall 2015. Restoring the long-form census was advocated by academics and the Canadian Association of University Teachers (CAUT), among others. In May, census packages are delivered to households across Canada, providing residents with the information they need to complete their questionnaire online or on paper.